Here are the predicted Premier League lineups for Gameweek 35. These EPL predicted lineups will help you create the best Fantasy Footballl team for your Fantasy Premier League team on Sportito. 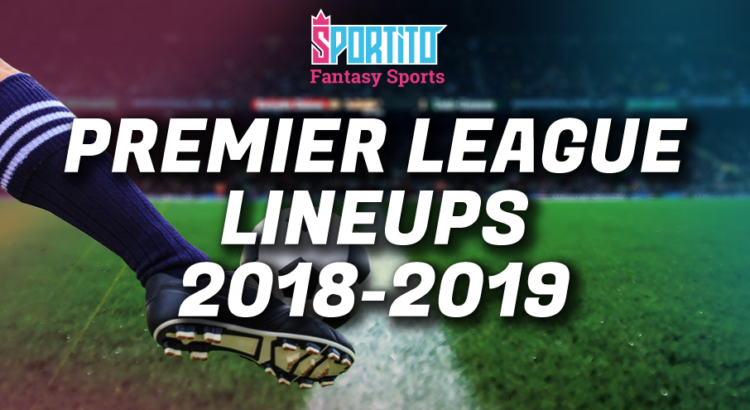 Get these EPL probable lineups when drafting the best fantasy Premier League lineups for contests on Sportito every match week. We will update this article for every EPL match, so make sure you check out this before you draft your lineups on Sportito. Manchester City (4-3-3): Ederson; Walker, Stones, Laporte, Mendy; De Bruyne, Fernandinho, Silva; Bernardo, Aguero, Sterling. Tottenham (4-2-3-1): Hamer; Smith, Schindler, Kongolo, Durm; Bacuna, Hogg; Mody, Pritchard, Lowe; Grant. Watford (4-4-2): Foster; Femenia, Mariappa, Cathcart, Masina; Hughes, Capoue, Doucouré, Pereyra; Deulofeu, Deeney. Cardiff (4-1-4-1): Schmeichel; Pereira, Maguire, Evans, Chilwell; Ndidi; Gray, Tielemans, Maddison, Barnes; Vardy. Fulham (3-4-3): Rico; Chambers, Ream, Le Marchand; Christie, Anguissa, Cairney, Bryan; Sessegnon, Mitrovic, Babel. Everton (4-2-3-1): Pickford; Coleman, Keane, Zouma, Digne; Gomes, Gueye; Richarlison, Sigurdsson, Bernard; Calvert-Lewin. Wolverhampton (3-5-2): Patricio; Saiss, Coady, Boly; Doherty, Dendoncker, Neves, Moutinho, Jonny; Jimenez, Jota. Brighton (4-3-3): Ryan; Montoya, Duffy, Dunk, Bernardo; Gross, Stephens, Propper; March, Murray, Jahanbakhsh. Southampton (3-5-2): Gunn; Bednarek, Yoshida, Vestegard; Valery, Prowse, Romeu, Hojberg, Bertrand; Ings, Redmond. Manchester United (4-3-1-2): De Gea; Dalot, Lindelof, Smalling, Young; McTominay, Fred, Pogba; Lingard; Lukaku, Rashford. Cardiff (4-4-1-1): Etheridge; Peltier, Morrison, Manga, Bennett; Hoilett, Gunnarsson, Arter, Murphy; Camarasa; Niasse. Crystal Palace (4-4-2): Guaita; Wan-Bissaka, Dann, Kelly, Van Aanholt; Townsend, McArthur, Milivojevic, Schlupp; Batshuayi, Zaha. Chelsea (4-3-3): Kepa; Azpilicueta, Christensen, Luiz, Emerson; Kanté, Jorginho, Loftus-Cheek; Hudson-Odoi, Higuain, Hazard. Burnley (4-4-2): Heaton; Lowton, Tarkowski, Mee, Taylor; Hendrick, Westwood, Crok, Mcneil; Wood, Barnes.